The Rifles Museum (also known as the Rifles Collection) is the regimental museum of The Rifles, the largest infantry regiment in the British Army. The Rifles were formed from four existing regiments in 2007 following re-organisation. The museum has an unusually modern focus, including recent campaigns in Iraq and Afghanistan and it is particularly concerned with the lived experience of the soldier in these campaigns. The exhibition begins with the formation of the regiment and focuses predominantly on Iraq and Afghanistan, where the Regiment has been serving. The display consists mainly of information panels and glass cases containing uniform, military equipment, ephemera and souvenirs taken by soldiers. There is a particular focus inter-cultural issues involved in working in these countries. It includes a display of Afghan life and features guides given to soldiers on local customs and useful phrases. The middle of the exhibition space contains a memorial and contemplation area, featuring a cross made of wooden pallets built in Afghanistan to remember members of the regiment who had recently died. The galleries are spacious and large artwork and photography were notable features compared to other regimental museums on the site. A merchandise area has regimental caps, sweatshirts and other clothing for sale. It also had an area for children to dress up in military uniform and sit on a quad bike for photo-opportunities. One display features Iraq ‘tour’ T-shirts featuring Basra Palace, where the Rifles were stationed for some time. The designs parody the famous Carlsberg advert: ‘Basra – probably the worst palace in the world’. The museum, which opened in 2013, is close to the Rifles regimental headquarters at the Peninsula Barracks in Winchester. The Barracks are extensive buildings built in the early 20th century and are grade II listed, how housing several military museums alongside regimental offices and private flats. 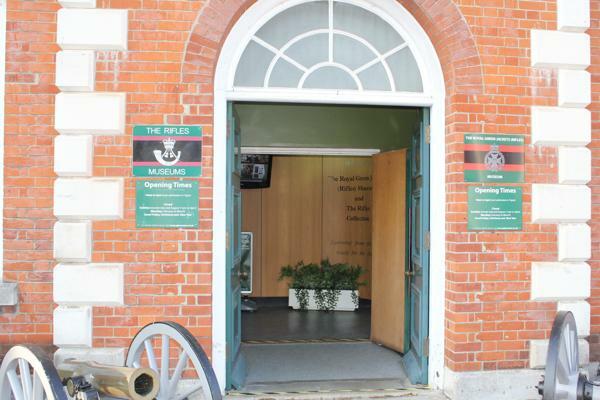 The Rifles Museum shares a building with the Royal Green Jackets (Rifles) Museum. The latter was one of the constituent regiments merged in 2007 to form the Rifles and has a much larger exhibition space over two floors including a huge model display of the Battle of Waterloo. 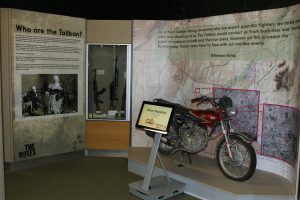 The Rifles Museum is separately managed and has a smaller exhibition space on the ground floor. Visitors can enter the Rifles Museum directly (entry is free) but chronologically it focuses entirely on the period after the formation of the regiment in 2007 so visitors are encouraged to see it after the Green Jackets Museum (which focuses entirely on an earlier period, 1741 to 2007). The museum is run by the Rifles Regimental Museum Trust (registered as a charity in 2017).